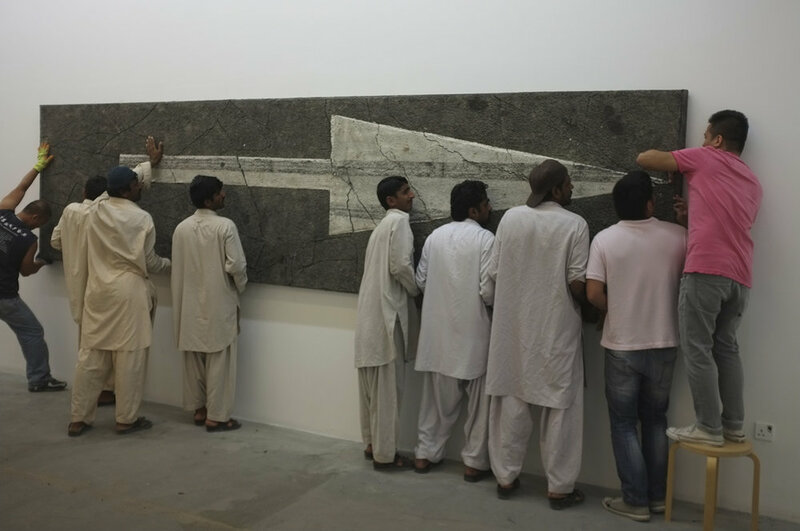 'Urban Epidermis' is a series of large-scale wall sculptures made from road construction materials in a Dubai factory compound. 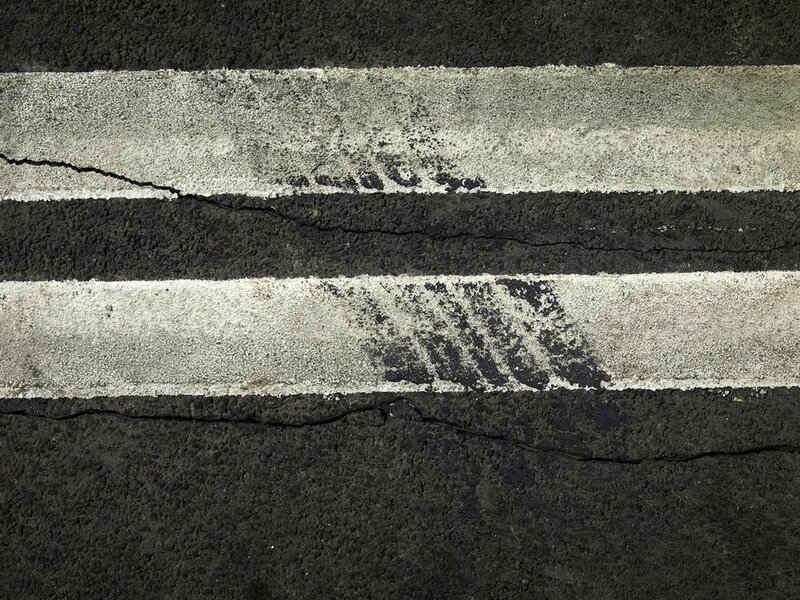 The fractured urban surfaces reflect on the human condition. Man and the city share a curious alliance. They build and exhaust each other, depend on and deceive one another. When this relationship takes an abusive course it leaves behind many fissures, fractures and fragments. A journey of dilapidation; cracked surfaces layered over the years by cyclic tire marks, and machinated patterns endured by individuals regularly traversing this course. Residing and working in recently developed areas in Dubai the artist can’t help but notice the new infrastructure that surrounds him. They stand in stark contrast to the ageing neighbourhoods he is more familiar with. Assimilating from these abused grounds one can debate what the fast germinating concrete sectors have in store for their settlers. Do the progressive forces that are driving this growth have a plan for the miniscule unit called the individual in this larger scheme? Will these communities and their populace be forgotten as we shift our focus to the next modern development? 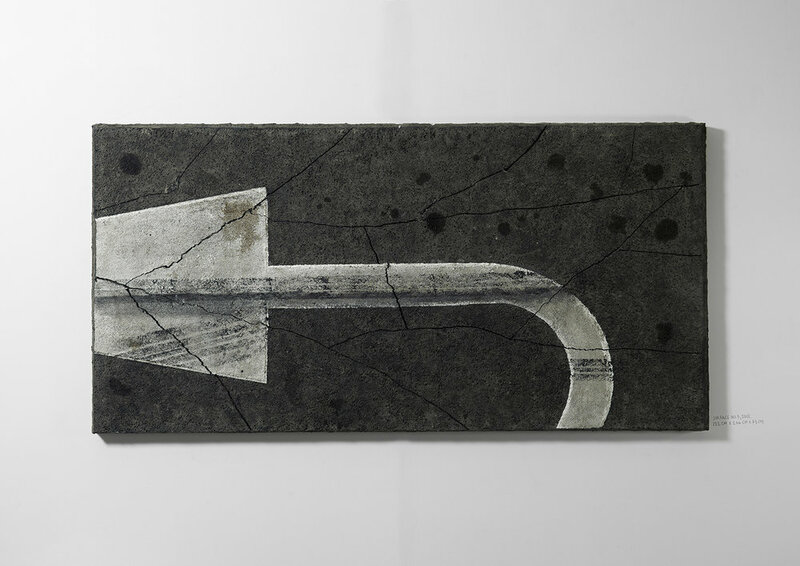 The works/substrates presented can be viewed as excerpts from an urban page, as well as pieces of anticipated evidence, where the urban condition mirrors the face of the human condition. Entire communities then seem like commodities that come with an expiry date. 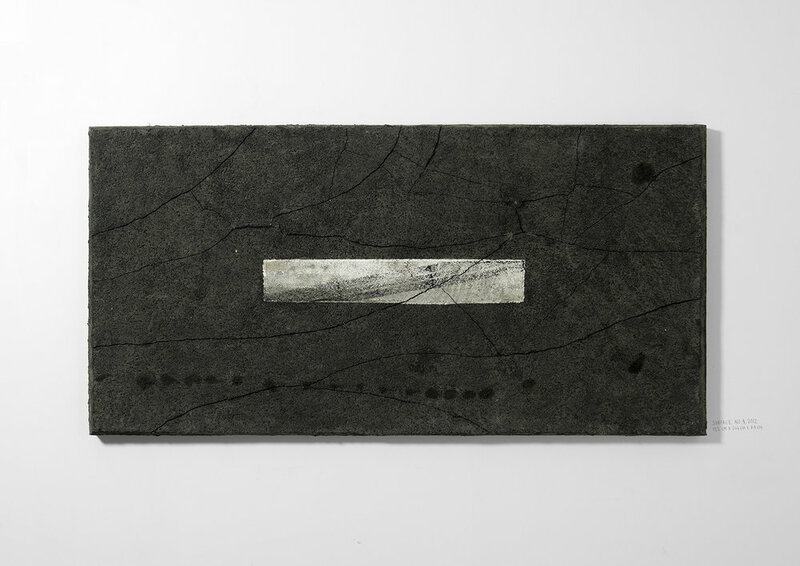 The process to create these surfaces was developed over 7 months using a number of industrial materials. A considerable amount of time was spent with road construction factories to understand how they build asphalt surfaces. The works were made at a Dubai factory compound, with technical inputs from a contractor. 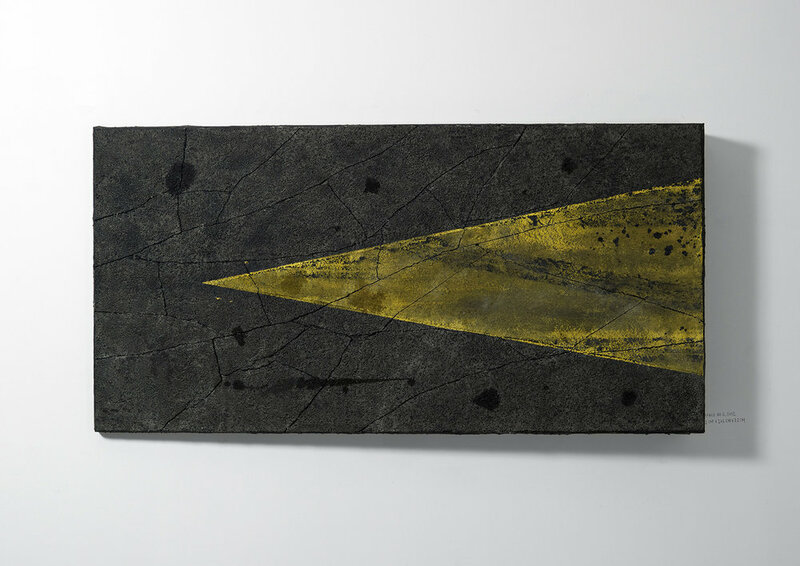 Cement fibre boards were layered with aggregate, bitumen paint, road marking paint and other materials. These were exposed to outdoor conditions during the summer, after which they were driven over and physically abused to create dilapidated surfaces. This project was supported by Mr Pillai and the entire team at Tekncoat International Factory, Mr. Syed Reffai (Ascon Road construction), Mr Qazi (Falcon chemicals), Mr. Brendon Poole (C.A.T decor), Mr. Ram Saran, Kevin Jones and Mr. Sobhnath. 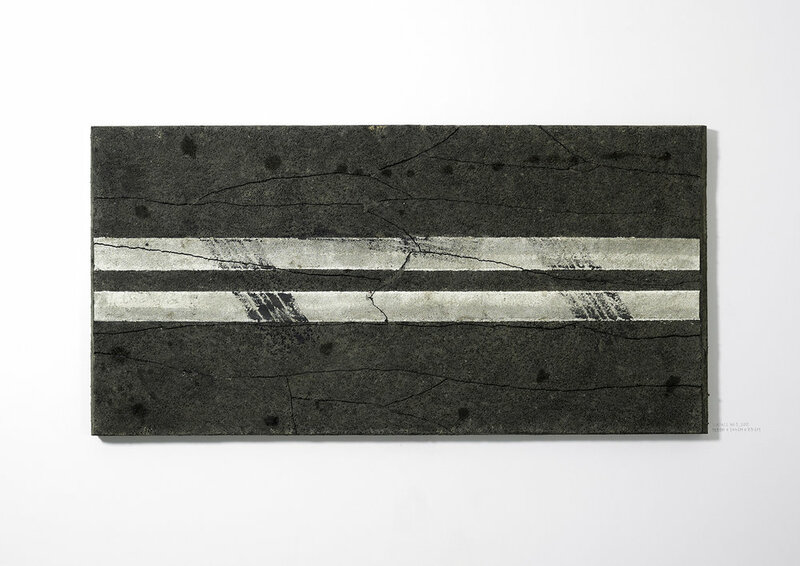 The 'Urban Epidermis' series was first exhibited at Traffic, a community and art space in Dubai initiated by Rami Farook.